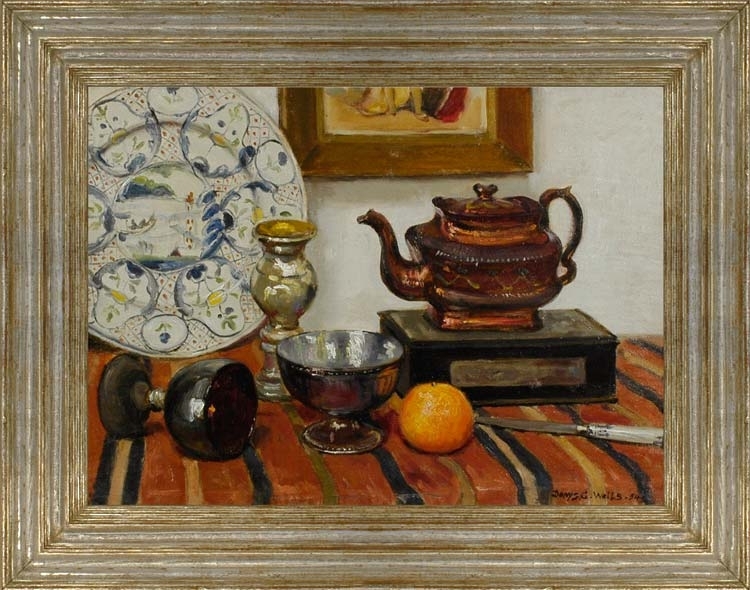 One of Wells’s characteristic arrangements of items on a cloth-covered table against a wall, this sophisticated still life creates a fugue, vibrating with light and colour, out of different metallic and lustrous surfaces. The silver- and pewter- ware objects, with their gilt or copper interiors, are set against the faux metal of the coppery lustre teapot, and the mother-o’-pearl knife handle and panels of the box. The colours are reflected in the grey and russet striped cloth, the orange, and the framed painting above; also in the imari plate, which provides a counterpoint in its delicate patterns and vignettes.